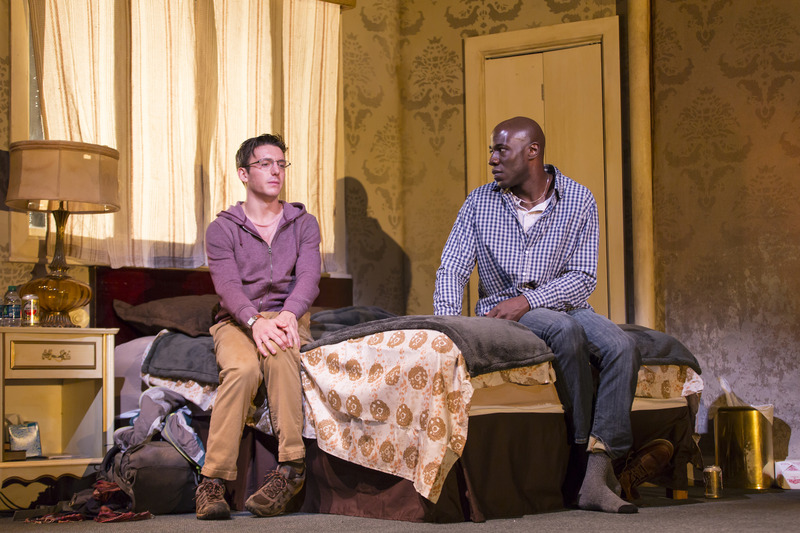 Samuel H. Levine and McKinley Belcher III in the Huntington Theatre Company’s production of A Guide for the Homesick, directed by Colman Domingo, playing October 6 – November 4, 2017, South End / Calderwood Pavilion at the BCA. © Photo: T. Charles Erickson. BOSTON – When we’re carrying a heavy burden, our tendency is to try and off-load it in any way we can. When two men meet in 2011 in an Amsterdam hotel, they end up going back to the rather dark, dingy room of one of them. They find a refuge in each other, and after coming together physically, they find the courage to bare their souls. The Huntington Theatre Company’s world premiere production of Ken Urban’s “A Guide for the Homesick” at the Calderwood Pavilion of the Boston Center for the Arts is a searing, powerful look at two men, each trying to explain what happened to another caring soul. Jeremy (Samuel H. Levine) is on his way home from East Africa after a stint as a volunteer nurse at a clinic in Uganda when he meets Teddy (McKinley Belcher III) at the hotel bar. Urban, a Huntington Playwriting Fellow, has some fun by inserting local color in the proceedings with Jeremy as a 20-something Harvard grad and Newton native, while Teddy, in his 30s and working in finance, didn’t graduate from Harvard and hails from Roxbury, a short drive from Newton but far away from it in other ways. When they get together in Teddy’s room, they begin a cautious pas de deux, with Jeremy seemingly eager to make his flight the next morning and ambivalent about staying. “I wanted to be a hero,” says Jeremy about his stint in Africa. Teddy is out but Jeremy steadfastly maintains he isn’t gay and mentions a girlfriend, but his denials don’t ring true. They come together passionately. Inserting flashbacks into a play is a device that has been used fairly frequently and effectively by other playwrights in the recent past, and here the split-second changes in time and place are usually signaled by an audible sound and a change in lighting. It requires both skilled actors and a director – in this case, Colman Domingo – who can assist them in making the lightning-quick transitions while also keeping the thread of the story apparent to theater-goers. Belcher as Teddy is an affable sort; he will then turn around and be Nicholas, the gay man befriended by Jeremy in Kampala whose life is at risk because he is having an affair with a closeted married man. In a country intolerant – that’s putting it mildly – of gays, his very life is on the line when he confides in Jeremy. Belcher shines as Nicholas, a character totally different in tone, accent and manner. Levine will morph instantly from Jeremy to Eddie, Teddy’s mentally troubled best friend who is in Amsterdam for a bachelor weekend but is off his meds and in deep trouble somewhere. Where that is Teddy does not know. Meanwhile, Eddie’s fiancee Margo is calling and Teddy’s not answering. The cast and Domingo ratchet up the tension with each flashback until events reach a terrifying level. Urban has us hoping that the burdens each came into that hotel room with have been lessened, and they will be able to face their future.